Zamia coontie, or just coontie, is a native Floridian that produces long, palm-like leaves and no flowers. Growing coontie is not difficult if you have the right spot for it and a warm climate. It adds tropical greenery to shady beds and enlivens indoor spaces when planted in containers. This plant goes by several names: coontie, Zamia coontie, Seminole bread, comfort root, and Florida arrowroot but all fall under the same scientific name of Zamia floridana. 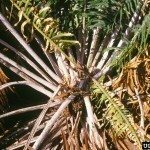 Native to Florida, this plant is related to those that existed well before the dinosaurs, although it is commonly mistaken for a type of palm or fern. The Seminole Indians as well as early European settlers extracted starch from the stem of the plant and it provided a dietary staple. Today, the coontie is threatened in its natural habitat. Disturbing natural plants is prohibited, but you can get Florida arrowroot to plant in your garden at a local nursery. It is a great plant for shady spots, edging, creating groundcover, and even for containers. Zamia coontie plants are easy to grow if you have the right conditions. These plants grow well in USDA zones 8 through 11, but they are happiest in their native Florida. They prefer partial shade and will grow larger with shade, but they can tolerate full sun too. They can even tolerate salt spray, making them great options for coastal gardens. Once established, your Florida arrowroot will also tolerate droughts. Planting a new coontie is the most difficult part of the process. These plants are sensitive to being moved. Always remove a coontie from its pot when the soil has dried out. Lifting it out of wet, heavy soil will cause pieces of root to fall off with the dirt. Place the plant in hole that is wider than the pot to a depth that allows the top of the caudex, or stem, to be a couple of inches above the level of the soil. Refill the hole, gently pressing to remove air pockets. Water until it is established, but err on the side of under-watering this plant. 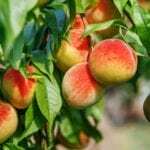 Coontie arrowroot care doesn’t require much work on the part of the gardener, although you should look out for a few pests: Florida red scales, long-tailed mealybugs, and hemispherical scales all commonly attack coontie. Heavy infestations will slow the growth of your plants and make them look unhealthy. A plant called a mealybug destroyer can be introduced to eat both mealybugs and scales. For Florida gardeners, coontie is a great native plant to add to the garden. 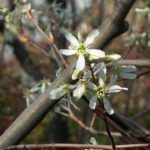 With its decline in the natural environment, you can do your part to help this local shrub by planting more of them in your shade beds. Read more articles about Coontie Plants.